Olga Massov is The Sassy Radish, a food writer and a home cook. Her first cookbook, The Kimchi Cookbook, will be published November 27, 2012 and is available for pre-order. She is at work on her second cookbook, which will be out in 2013. Heat oven to 375 degrees and position the rack in the middle. In a small saucepan set over low heat, bring the milk and the cream to a simmer. Place challah cubes in a bowl. Remove milk-cream mixture from heat and pour half of the liquid over the challah. Let sit. In a stand mixer fitted with a paddle attachment set on high speed, cream the butter and the brown sugar until light and fluffy (start the mixer on low and gradually increase to high speed). Add the egg yolks, cinnamon, nutmeg, cloves, and allspice, beating well, on medium high, until emulsified. Add apple sauce and the remaining dairy mixture, and mix until thoroughly combined. Fold the soaked challah into the apple sauce mixture. Place the egg whites in a clean, dry bowl and add the sugar and the salt. Starting with the mixer on low and gradually increasing the speed to high, beat until the egg whites form stiff peaks. Gently fold the whites into the batter. Butter and sugar a 3-quart soufflé dish or 8 3 1/2-inch ramekins, then place or evenly divide the batter. If baking in a soufflé dish bake the pudding about 1 hour and 30 minutes or until a knife, inserted into the pudding, comes out clean. 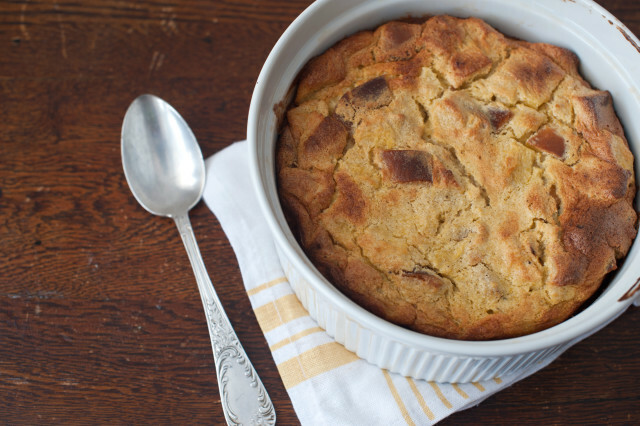 Check on your bread pudding after 1 hour. If the top of your bread pudding starts to get too brown, cover it with tin foil and continue to cook.) If using the ramekins, bake the pudding for about 25 minutes, or until a knife, inserted into the pudding, comes out clean. Baked puddings can be wrapped and kept in the refrigerator for up to 3 days, then heated in the oven wrapped in foil or microwaved until warm.